In recent years, quality JRPG's have been hard to come by compared to previous generations, so it's always nice to come across a title like Radiant Historia. It takes the best element of one of my all-time favorite games in Chrono Trigger and adds some of it's own creative flair to produce one of the most enjoying role-playing experiences out there. You are Stocke, a skilled soldier chosen to wield the White Chronicle, a mystical book that gives Stocke the power to traverse time and manipulate history itself. A great catastrophe is rapidly approaching; to stop it, you must repair two different timelines and unite them, as well as a nation ravaged by years of conflict, to rescue the world of destruction. 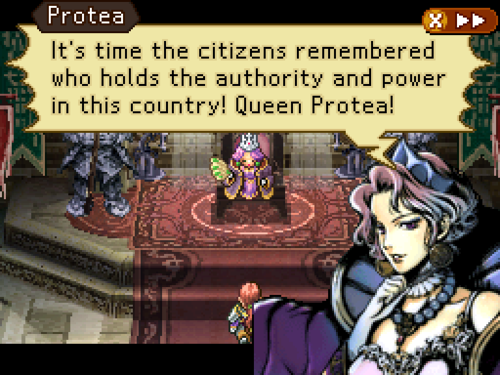 While Radiant Historia’s cast may be a checklist of JRPG prerequisites (the aloof protagonist, the princess in disguise, the annoyingly cheerful youngster, etc.) the story shakes up the old formula with an intelligent and mature narrative that takes several dark and, often, unexpected twists. Villain’s motives are often the result of good intentions gone wrong and doing right is tricky matter of perception. I have to give particular praise to the ending. I don’t want to spoil it, but I applaud Atlus for not taking the easy way out with a bittersweet conclusion that satisfies without insulting my intelligence. 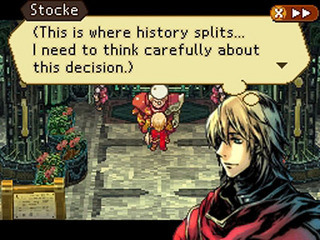 Like Chrono Trigger before it, tinkering with history is the main draw of Radiant Historia. A simple example of this would be preventing the death a merchant in the past to ensure he lives to reach a crucial point in the future, where you’ll need a specific item from him to progress. Other problems are much more complex, requiring a lot of back and forth between realities as well as some out-of-the box reasoning. Sometimes the results of your efforts are not evident until much later and even the most dissimilar occurrences could have hidden connections. One memorable event, which I dubbed the “Chris Nolan” moment, lacked a true conclusion, and had me searching for closure until its link with future happenings was revealed towards the very end of the game in a true “ah ha!” moment. Your actions also affect the side quests; failing to interact with someone in the past may prevent them from giving a mission later, for example. To help sort out wheres from the whens, the White Chronicle contains useful outline of everything you do, in chronological order, serving as a sort of time map. Every event comes with a summary of how things played out and hints if there’s more to be done, making it a handy reference. The more situations you encounter, the more complex and web-like your map becomes, illustrating just how much of an impact you’re having on the annals of time. Narrative choices are also present. While some are clearly defined as being good or bad, most of them can really blur the line and what you believe to be your best judgment may still yield undesirable results. I always appreciate when decisions are painted in shades of grey but when both solutions seem faultless, choosing almost becomes a guessing game; I literally had to flip a coin on one of the foggier choices. Bad outcomes play out in “what if” style scenes showcasing the disastrous (and often funny) consequences of your decision, and you’ll have to reload the event to make the right decision. After successfully making a right choice, I always replayed the event later to make the alternate decision, just to see the hilariously ridiculous downturns history would take. Steering the world into an unspeakable doom is great, but the awesome battle system pulls its weight in the fun department too. 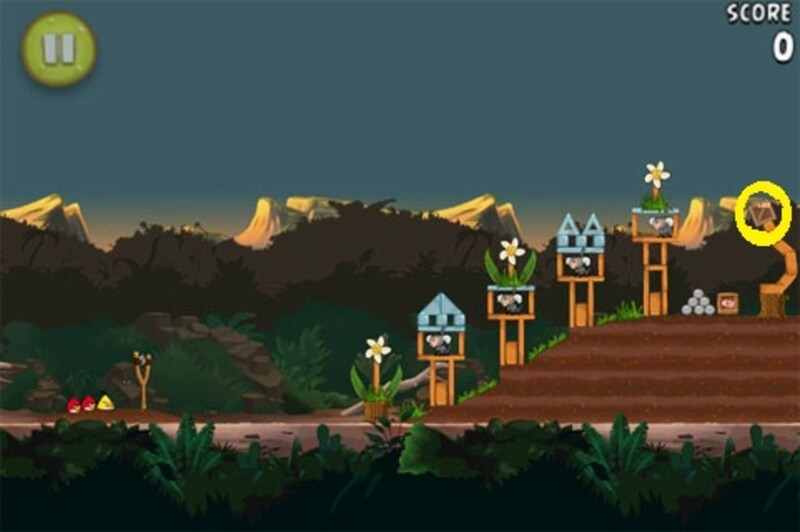 Enemies are arranged on a 3x3 grid. Their placement isn't arbitrary; the closer they are to your party, the more damage they deal, and they’re constantly shifting to counter your strategies. Manipulating your opponent’s position is the recipe for success. 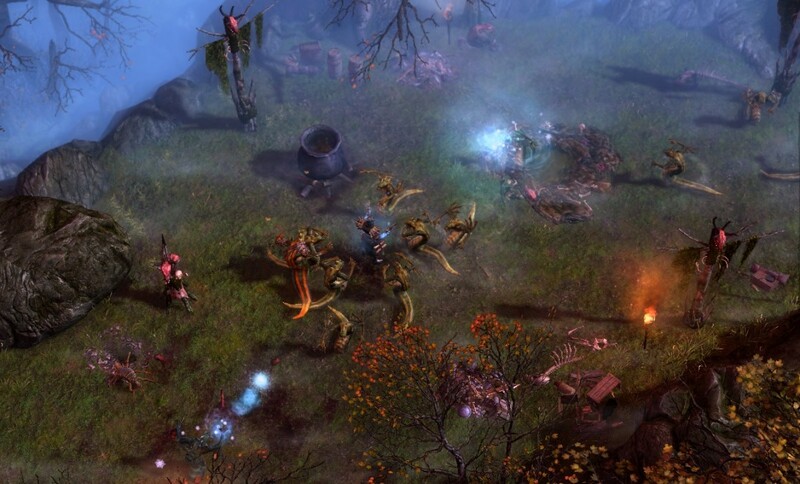 Foes can be knocked back, brought forward, hit left and right, or even into each other. More powerful attacks cover entire rows or even the entire field. 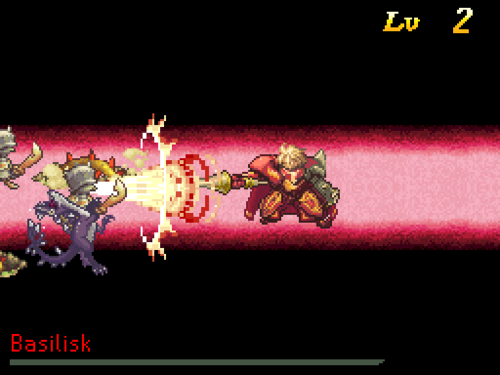 Consecutive attacks create devastating combos that deal scores of damage and soften them up for the always awesome Limit Breaks. This incredibly involving battle system trounces the, by comparison, static encounters of other games in the genre. You’re not just focused on the mere strength of foes. Their continually changing positions keep you on your tactical toes, ensuring you’re always altering your strategies to counter where they are and when. Turn order, something I tend gloss over in other JRPGs, is vital here. You can swap you and your opponent’s turns anytime during a fight and making sure it flows in your favor is crucial, especially since it plays into aforementioned combo system. Moving your next turn, thus allowing a barrage of enemy offense, may cost you some hits, but could be well worth it if it means a powerful unified assault. Outside of battle, exploration is kept interesting thanks to a handful of extra tricks such as stun attacks, bombs and cloaking. Monsters are visible in the field, and stunning creatures before engaging them rewards you with a huge advantage in the battle. Bombs are used to clear obstacles, as you'd expect, and cloaking renders you invisible, though I rarely felt compelled to use that ability outside of required stealth missions. 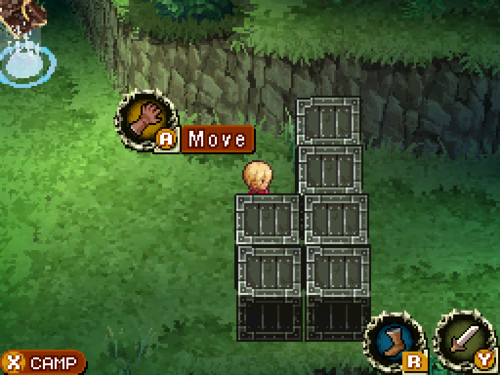 Radiant Historia deserves the oodles of praise I'm showering it with, but that doesn’t mean it’s completely infallible. Not every point in history can be revisited, and reaching a specific checkpoint may require replaying entire scenarios before it, including boss battles. This gets annoying very quickly when you only want to check one little thing at a certain event. Worse case is completing large areas of the game again to reach a period you thought you needed to be in only to discover that it’s not. Another issue is that at certain points, a timeline’s progress is locked out, so you’ll have to spend long durations playing the other history until the previous one opens again. 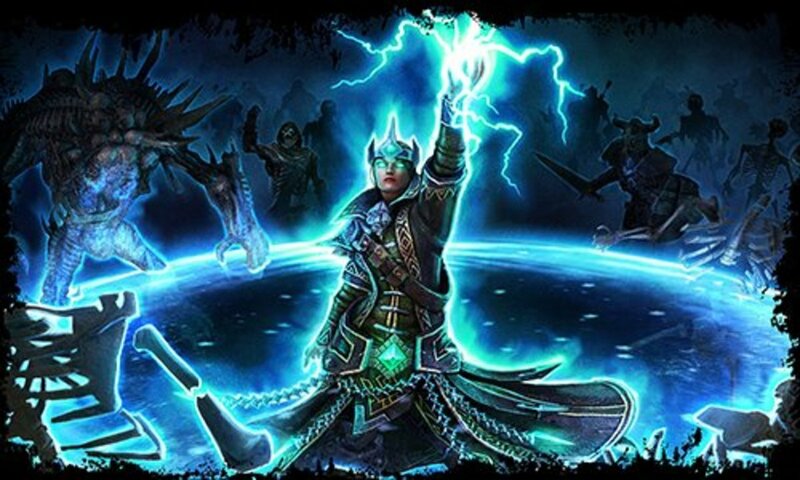 Characters do gain experience off the battlefield, but only if they’re in your party. Since your party changes depending on where (or more accurately, when) you are, the party members linked to a halted storyline are stuck involuntarily warming the bench while your current squad reaps the benefits of combat elsewhere. Once you return to the other reality, you’re greeted with under-powered allies. Thus, whenever I was stuck in one timeline for the long haul, it became necessary to revisit points of the OTHER history whenever I was able, so that I could grind the characters there. That way, upon my return, I wasn't stuck with a jobber on my squad of main-eventers. The superb battle system does remove some of the tedium from the grinding, but I wish that area of leveling was handled better. 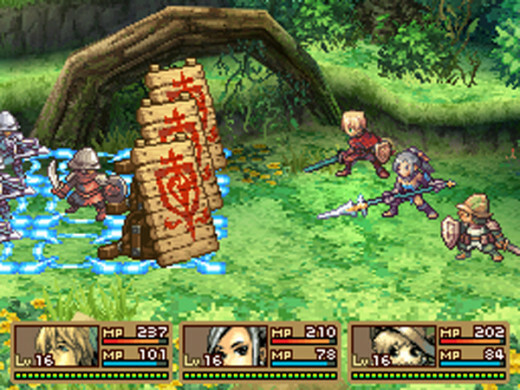 Radiant Historia is one of those rare treats in a genre bogged down by decades of tired cliche's and conventions. It might not totally reinvent the wheel, but it injects enough creativity and sophistication into the JRPG formula to give it a much needed breath of life. Fans of Chrono Trigger's time-warping JRPG goodness and role-playing enthusiasts looking for a unique entry in their favorite genre have no excuse. 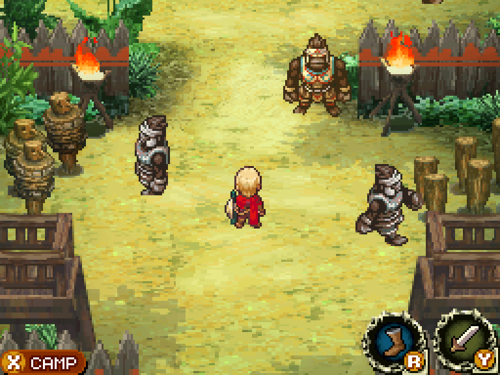 Play Radiant Historia. A good little review here, lots of images and detailed information. Thanks for taken the time to write this.